It’s Wednesday and I *must* review wine. Sigh. Such a tough job to do 😉 Today’s wine was a Christmas present from my brother Rick. He loved the bottle art on If You See Kay Wine! I can see why, it is absolutely awesome!! This heavy Cabernet Sauvignon blend had been left to open up for about an hour by the time I finished taking all the photos. I did taste it when I first poured it and it was a bit jammy. After letting it to open up a bit, holy amazeballs, Batman. This wine pours deep red, almost black, and you can taste that it is very well-balanced, but yet quite powerful. What was first a jammy taste opened into a deep blackberry flavor with hints of mocha throughout. Delicious. If You See Kay is a red blend from the Lazio region in Italy. 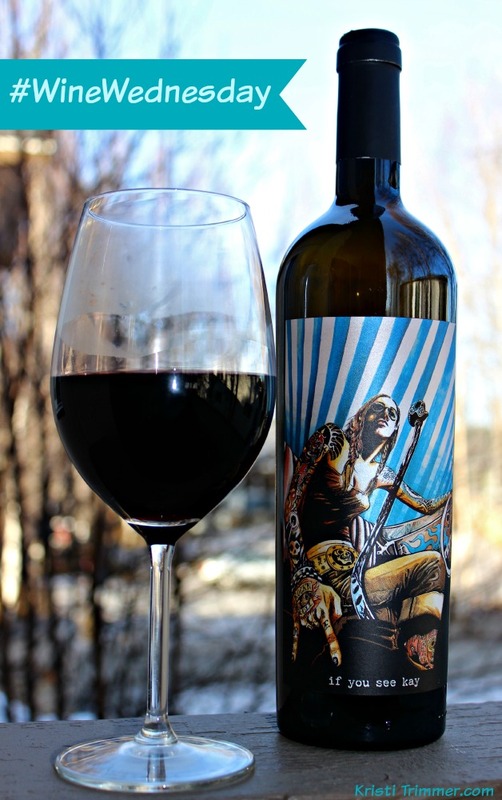 The 2012 Blend is made from 80% Cabernet Sauvignon, 10% Petite Verdot, 5% Syrah, and 5% Primitivo. When I looked up in this wine and read the back story, my jaw dropped. The tattooed woman on the bottle riding a motorcycle, might not be me in appearance, but she sure is philosophy of life. Kay embodies the concept of living life to the fullest, as I do. This wine is about taking chances and the concept of Wide Open Throttle, which simply means freedom. Freedom to be true to one’s beliefs and dispensing with conventional thinking and boundaries in living life and in winemaking. And, if necessary, kick-starting a little controversy along the way. Enjoy the ride, Kay Kristi is! Seriously, this wine is SO me!!! You can find If You See Kay Wines can be found at retailers throughout the US, and even at Costco! I don’t know about you, but I love having wine delivered to my door every month. Don’t forget to check out these 5 Fabulous Wine of the Month Clubs! I’m not much of a wine drinker. I don’t know how to choose a wine. The only wine that I have tasted and loved is chocolate flavored. It’s a bit heavy but so good! The best way to start out is to try recs from friend. I kept a wine journal and wrote down what I liked and didnt. It made it easier to order one at restaurants bc I kinda sorta knew what I wanted.